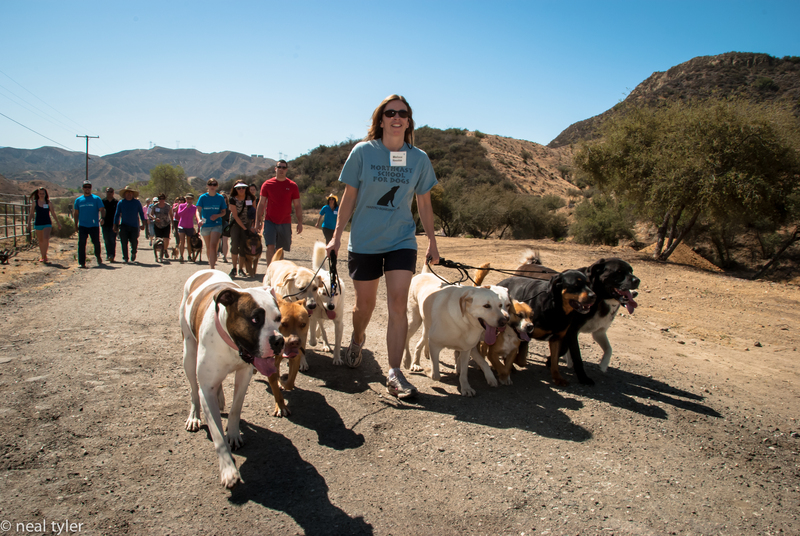 Each day at the Dog Psychology Center we started the morning with a pack walk. It was a daily ritual that put us all in the right state of mind. The dogs loved the exercise and the people found it as a way to connect with each other. We traded off dogs and assisted each other with techniques. I’ve never seen such a big group of people look so upbeat and enthusiastic in the morning. Prince, the German Shepherd was a dog with A LOT of energy to burn. Cesar showed us how to drain some of his energy by letting him do what he was bred to do, herd. At first he went in the paddock with Lorenzo, the llama and later in the afternoon he was taught herding basics with a flock of sheep. Prince enjoyed his new job and settled down nicely that afternoon. Each day Cesar started us out with lecture and demos in the classroom. He used humor to get many of his points across. Again, instead of telling us the answer to our questions, he presented us with basic fundamental points and asked us questions so we could discover the answer on our own. Everything from reactive dogs to socialization to raising a puppy were covered. He even told us a lot about his personal life and how he arrived at his present day situation. He was very real, not an uptight celebrity, but an extremely generous man with a very positive attitude. He spoke about his climb from the bottom to the top, his attempted suicide, and his recovery back to the top. It was emotional and inspiring. The DPC was a magical place to be. I know that sounds corny, but it’s true. It was amazing to see these dogs who were at the end of their rope, (no pun intended) be able to function once more as happy, stable dogs. It was a place of transformation for people as well. Some people were frustrated with their dog’s behavior, suffered from PTSD, or just needed to understand their dogs better. Each day when we left the center we felt rejuvenated, empowered, and ready to take on the world. As a trainer for over seventeen years, I’ve helped hundreds of people with their dogs. Each dog teaches me something new. Learning to adapt my methods for each dog helps to ensure that I address issues specific for that dog. Training methods vary, and I am always open to learning new techniques. In April of 2013, I had the opportunity to attend a training workshop of my favorite dog expert, Cesar Millan. I was so excited to spend five days with the Dog Whisperer at the Dog Psychology Center, I couldn’t stop smiling. Think about it, who’s your idol? Who would you love to meet and better yet, spend several days with? I was beyond excited. On the first day I traveled to the Dog Psychology Center with a couple of the other participants. We met the night before and hit it off so we decided to carpool to the center the next day. The DPC is located in the mountains of Santa Clarita, Ca. The land was dry, hot, and sandy with scrubby bushes. The only areas of green vegetation are around the DPC itself. As we parked, we saw Cesar hop on his ATV and drive down the long driveway to meet us trailed by his “right hand” dog, Junior. Approximately 16 of the other participants had their own dogs with them and we were soon joined by three of Cesar’s trainers and about ten other dogs. We would start that day like we did every day there, with a pack walk. After the walk, we entered the classroom. Cesar spoke for several hours about dog psychology. He was very relaxed and personable and never hesitated to stop and answer a question. Actually, he didn’t really answer our questions, but had people describe their situation, asked them questions, and led them into finding the answer on their own, much like a good therapist does. There were many “aha” moments with several people breaking down and crying because they broke through years of emotional barriers. The time flew by, and soon it was lunchtime. Lunch was a gourmet experience. No sandwiches and chips here. We had fresh grilled meats and delicious sides while we sat in the shade and socialized with the other participants and Cesar. It was a very family oriented experience. The other participants were from all over the globe; USA, Canada, Australia, UK, Mexico, Columbia, and Brazil. We all shared things in common, our love of dogs and our admiration of Cesar Millan. He spoke to us about how the DPC was his dream. He had made this oasis in the desert after many years of struggle, stardom, triumph, and turmoil. He’s a very funny guy and he told hilarious stories of his journey to the US, his family, and some kooky celebrity clients. He also spoke about his attempted suicide and his journey back to health. It was an amazing experience, sitting casually at a picnic table eating lunch with Cesar Millan and chatting about dogs. After lunch we learned how to assess a dog’s body language and energy. During the hands on demos we got to see Cesar in action. It’s even more impressive than it is on television. He truly has a gift and can interact with a dog like no one else. The day was filled with lots of laughing, crying, and amazement. Each day began and ended with a pack walk. We applied what we had learned and each pack walk became more enjoyable. It was only the first day but I was so exhausted (in a good way), I knew I would sleep well that night.